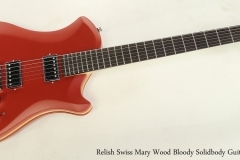 Fairly new on the scene, Relish guitars are designed built in Switzerland, a little northwest of Lucerne. They are innovative in both design and choice of non-traditional materials and assembly methods. The Twelfth Fret staff visited the Relish booth at the last NAMM show in Anaheim, and we’ve just taken delivery of a representative sample set. 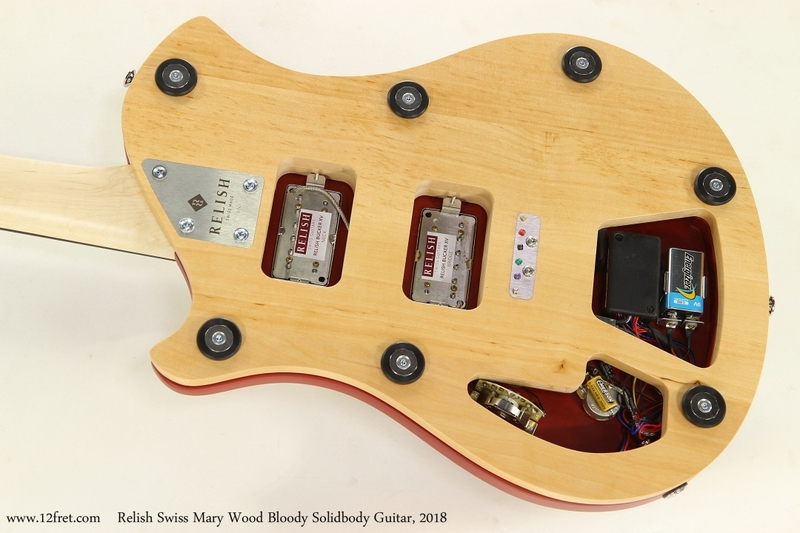 This example here is the Relish Swiss Mary Wood model in the “Bloody” finish, which has two standard humbucking pickups plus a piezo element with an active preamp. There are other Mary models with different center cores; here wood is used to warm the tone. The place to start, however, is what makes these guitars innovative and distinct. 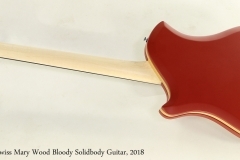 While the Relish models start with a traditional bolt-on neck and body core, the design rapidly diverges from the ordinary. The maple neck is bolted to a central core – for the Mary Wood, it’s a Alder slice – but the top and back are high pressure veneers and the fingerboard is Dark Strand Woven Bamboo. As you can see in the ‘Open Back View’ photo, the Alder core is cut away to allow mounting of all the hardware. The assembly is very neat and tidy; there is a lot of attention to detail in these builds. As well, the back is held on by a set of seven magnets running around the edge! It’s easy to pop the back off if you need to change a battery or a string. These guitars are very well thought out and very well made. Relish has been able to create a new design that doesn’t really look like anything else while still having an attractive shape. But above all – they sound good!